Where’s My Minority Sports Report? Mention the 2014 World Cup, and for most it would be the men’s football championship that springs to mind. This is despite the fact that England spectacularly fulfilled everyone’s expectations of mediocrity, whereas the women’s national rugby team romped to glory in a 21-9 victory in the final. World Champions, and yet the media decided that the men who could only achieve one draw deserved more screen time. Consider that it is also the second time England have won the women’s rugby world cup, and 1966 somehow seems even more distant than it did before. In fact I have to admit that this is something that I myself would have remained largely unaware of, were it not for the fact that we both grew up in the same town and shared several classes at school with England international Danielle “Nolli” Waterman. Considering she and her team-mates were representing the entire nation, it is nothing but a shame that their accomplishments received more space on the front page of our local broadsheet, The West Somerset Free Press, than from a large portion, if not all, of the national newspapers. Print media aside, coverage of the women’s rugby team fared much better on television. Not only has Nolli featured on the Clare Balding Show, but earlier today she also appeared with team-mates Maggie Alphonsi and Heather Fisher on Sky Sports’ Game Changers, a sporty Saturday morning kids show. Great coverage they no doubt deserved, but that which again, I was only made aware of through Nolli’s own advertising on twitter. In addition these were also both on dedicated pay to view sports channels, of which BT Sport is still up and coming, and seems to advertise to non-subscribers predominantly through their coverage of, you guessed it, men’s football. To be fair, it has to be said that sport isn’t my main passion, and not something I would normally seek out in terms of media coverage. Obviously there are those who do, and will no doubt have been made aware of the Rugby world cup long before myself and those others who rely only on more general media coverage. Whilst it can certainly be argued that the media is only a reflection of what the mainstream audience want to see, I would instead argue that it is in fact a vicious cycle: the mainstream audience often cannot want to see what it has not been made aware of by the media. Just as London 2012 and the Women’s Rugby world cup has shown, there is nothing like getting behind athletes representing your nation at international events to get the adrenaline pumping, and interest growing. Something which can also be said of disability sport. The BBC’s coverage of the 2008 Paralympics was limited to the red button, and four years later it was outbid by another broadcaster. Whilst it cannot be said that Channel 4’s coverage of the games at both London and Sochi were severely lacking in any way, it also cannot be said that their legacy goes much further than The Last Leg. 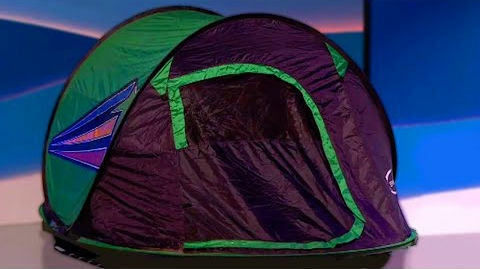 A Glasgow 2014 opening ceremony tent getting more air time than the games themselves. A satirical news programme which, despite originating from the 2012 Paralympic Games, still concerns itself more with whether its twitter followers considered the 2014 Commonwealth Games to be either #notshit or #abitshit, than the fact that it is the only major competition in which able-bodied and disabled sports are competed side by side. Whilst this fact was mentioned, even a show in which three presenters have only four legs between them still seems to cater to, rather than educate, a largely unaware audience. Meanwhile disability sport has continued to be played throughout the past two years as it always has done, even if it is still doing so in the background. Not to say that male footballers aren’t skilled athletes, but the amount of coverage they receive also gives them an unfair advantage off, as well as on the pitch. Whilst players for the England women’s rugby team are only just now becoming paid professional athletes, sportsmen who have been receiving large paycheques for their entire careers somehow still feel the need to supplement these with advertising deals. Not to begrudge them these opportunities, but it makes you wonder if their World Cup experience would have turned out differently had the England goalkeeper, Joe Hart, not spent his run up to the competition appearing in no less than three separate television commercials. The broadcasting of women’s and disability sport is far from adequate, and I would say that it is Wheelchair Rugby that can help bridge the gap that needs to be crossed. GB’s Kylie Grimes in action. 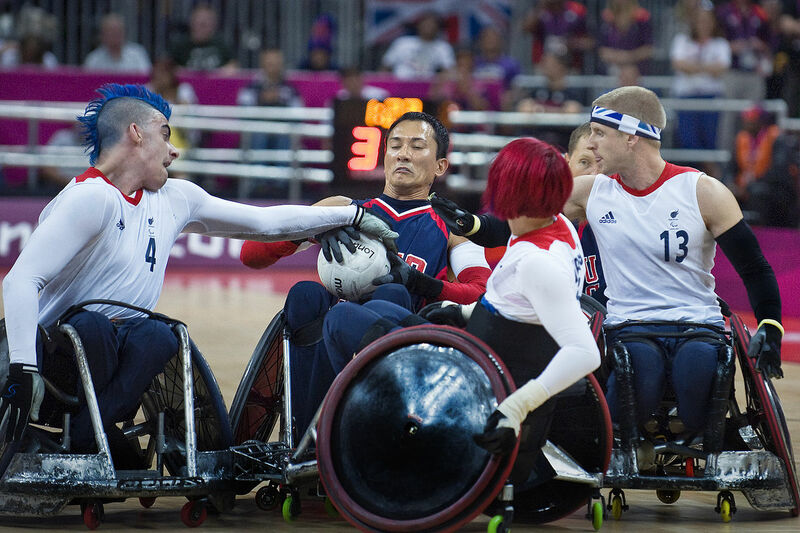 Wheelchair Rugby is perhaps the only sport that has something for everyone. It is a full contact sport in terms of wheelchairs crashing into each other, and the fact that these chairs/battering rams act as a barrier between player contact means that the contact can often be more aggressive than its grass pitch counterpart. Not only are there rules and classifications ensuring that those on the pitch are of mixed (dis)abilities, but while predominantly played by men, it is also a mixed sport in which both male and female players compete with and against each other, side by side. In addition, like any disability sport, the athletes have already achieved so much before even entering the pitch. To me, sport is all about personal achievement; I enjoy archery because it is one of those sports where it doesn’t matter how many others are on the shooting line with me, I am always competing against myself. By overcoming obstacles many of us would have trouble imagining, pushing themselves to higher and higher standards is nothing new to those who participate in Murderball. It’s now the 21st Century, and surely it’s time for decent coverage of sports that don’t deserve their description of “minority”. The advent of Sky Sports’ Sportswomen show last year was a great step forward, as is Game Changers introducing the younger generation to sports in all it forms, but one in which other broadcasters and newspapers need to not only follow, but also expand upon. Thankfully things are also changing for the better in terms of disabled athletes. Last year at the BBC Sports Personality Of The Year awards, Hannah Cockroft became the first wheelchair athlete to be nominated outside of the Paralympics, a far cry from 2000 when Tanni Grey-Thompson was unable to accept her trophy due to the stage not having the most basic of disable access. Surely it’s only deserving that the women’s England Rugby team be given the Team Of The Year award at this years ceremony in December, something which could, and indeed should, be the latest chapter of greater coverage of even greater sports.